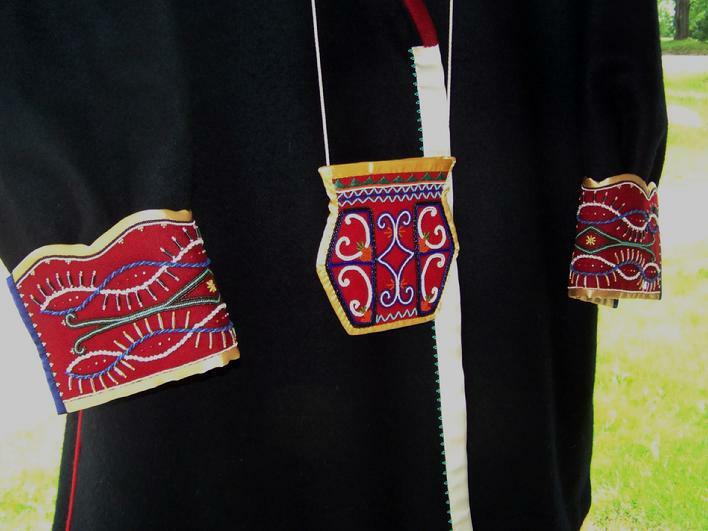 The beaded detachable cuffs are intended to honor the Penobscot People. This design came to me in a dream. The design seemed very different from what my waking modern mind was seeking, but since designs from the dream world are a gift, I put my hesitations aside. 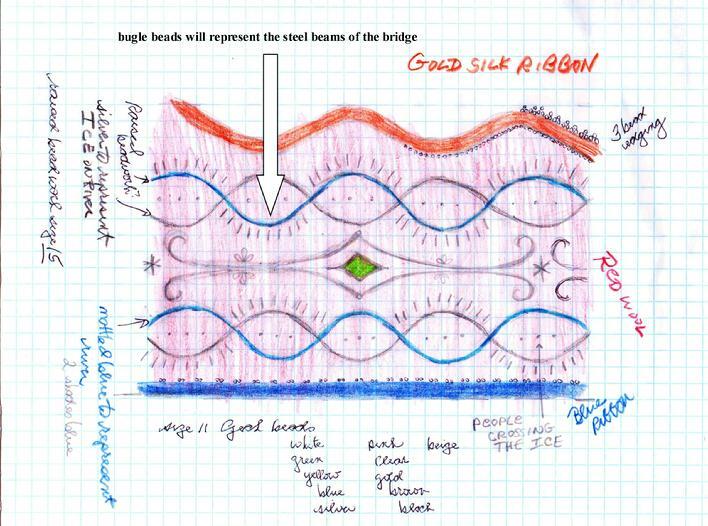 I sketched the design out quickly with colored pencils. I was immediately struck with how if one turned the design on its end, the intersecting pairs of oval curves resembled a DNA strand. I understood that these curves tell the story of the Penobscot peoples’ deep spiritual connection to the Penobscot River, a connection as deep as the DNA that runs in their bodies. The curves of blue, ice blue and white, represent the river in all its stages of change. The single row of beads inside the curves represents people crossing the river in boats, ferries or walking on the ice covered with sawdust. It is also a remembrance of the People who through accidents or drowning crossed from the physical world to the spiritual world. The bugle beads symbolize the steel beams of the bridge that was built in later years to connect Indian Island to Old Town. The green and brown elongated double curve design represents Penobscot land. The land is the foundation, the center. The Penobscot people were not relocated onto reservation land; they remain for all time upon their own homeland. The Star symbols represent the Penobscot Peoples’ connection to the Stars and Creation. The spark of life is represented by a few bright 24 carat gold beads. It is my hope that by writing this, you have a better understanding of the meaning contained in these beaded cuffs. The following is an explanation of the symbolism within the "Petroglyph" beaded purse. This is one example of the thought, care and spirit that goes into each and every beaded purse I create. There are old stone petroglyphs along the Connecticut River at Bellows Falls, Vermont. These old stone carvings in rock were most likely done by the local Abenaki Indians as this area was historically a good fishing spot. I find the messages in these rocks so intriguing, contemplating the meaning, and wondering who placed them there? Many of the ancient petroglyphs carved or scratched in rocks show faces that are gender neutral, some with “rays” around their heads. Other carvings show full body figures that can be readily identified as male or female. This gave me pause to think of how I with my 21st century mind and eyes might make a modern day petroglyph? This is what I tried to accomplish in this beaded bag. 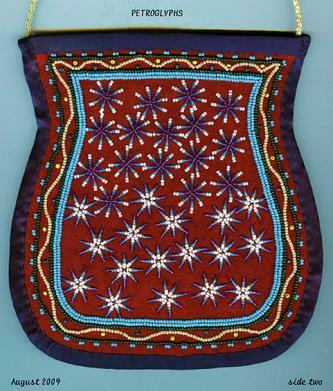 The size of this beaded bag is 6 inches tall by 5 ½ inches wide and is done almost exclusively in size 15 beads. It is lined with red calico cotton fabric and has a long beige colored silk corded strap. There are yellow and dark blue beads used on the “star” side that are antique and appear to be slightly larger than size 15. The very dark blue beads outlining the “rays” are cut on one side to give them an interesting random sparkle and a roughness that one sees on rocks. Notice the copper color beads in the very center of all the “stars” and along the seed pods on the green curves-these signify the spark of life. I like how the light hits these copper colored beads, and it reminds me of how important and valued copper was to Native people in this area. The blue wavy lines along the border symbolize the river. I chose the color of the dark blue silk ribbon along the edge to also represent the river. Regarding the two “faces“, the grey one represents the male, the multicolored dark blue represents the female. Notice the grey beads have a shine to them, this is how some of our granite rocks look when the sun is shining on them, a slight sparkle. Some of the old time petroglyphs show beings with rays around their heads. One theory is that these are feathers from headdresses, but in my beaded petroglyph these rays signify the male power/energy ,the light of the sun and fire. I have been taught that in the Abenaki culture, man is the keeper of the fire and the protector of life, thus man is very powerful in his own way. The female face is done in matte finish mottled dark blue/purple beads. This is how some of the wet river rocks appear, they become very dark. I have been taught that women have a very strong connection to water, and are the givers of life. From the top of the woman‘s petroglyph, comes the curled up fiddlehead design (a very old design), signifying new life in the plant world, the little white and copper colored beads along the fiddlehead are seeds, and around the woman are blossoming flowers. The woman’s mouth is an open circle, the circle of the life force in keeping with the giver of life theme, with white tubular beads, more energy symbols. The “stars” are on the other side, so many twinkling and shifting! Some believe the stars are where our Native ancestors originated and that we will return to the stars when we pass on. The totality of this design signifies physical life on one side, and spiritual life on the other. I have written this so one knows the thoughts that go into the placement of every bead on this little beaded purse, that these are mostly conscious choices, not random acts. And when a stray or odd bead happens to appear, well, it is welcomed and included too, as guidance comes not only from the conscious mind, but from spirit. Everything has meaning and a place, in an attempt to create a thing of beauty. 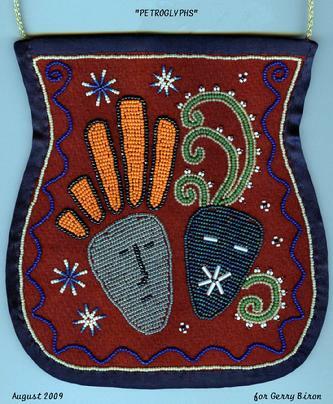 If there is ever a question of who made this beaded bag, my mark is inside.